One of my favorite things about granola is the big crunchy oat clusters that are mixed in with the smaller oat clusters. I often pick out the big clusters and eat them plain. Aside from eating it plain, granola is also great with milk or mixed in with yogurt. Homemade granola has been on my bucket list of recipes to try and I finally got around to making some recently. It was a a lot easier to make then I envisioned, but I had to make two batches of it before in met my approval. The first time around it turned out dry, salty, and not sweet enough. So I tweaked the original recipe I found and made it my own. My taste-buds were much happier with the second batch! Oats, almonds, flaked coconut, honey, brown sugar, and coconut oil pair together to create a sweet and nutty granola. 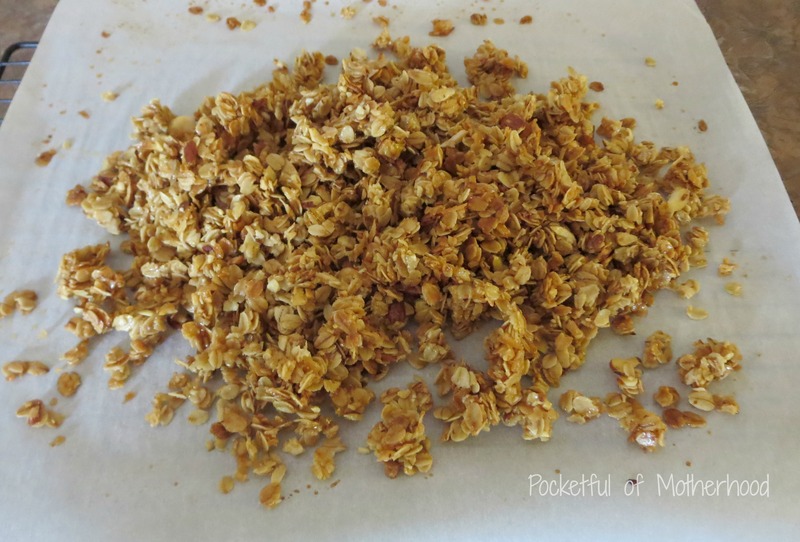 This granola is filled with delicious golden oat clusters. Tasty plain, with milk, or topped over your favorite yogurt. Store it in a Ziploc bag or any airtight container like a mason jar. Enjoy! 1. Preheat the oven to 300 degrees. In a food processor finely chop ½ cup of the almonds. Rough chop the other ½ cup of almonds or leave them as is (this depends on if you prefer small pieces or larger slices of almonds in your granola). 2. In a large bowl combine the oats, both almond mixtures, the coconut, the salt, and the sugar. 3. In a small microwave safe bowl, add ½ cup of honey and the coconut oil. Heat for 30-40 seconds; stir to dissolve the coconut oil. Then add the almond and vanilla extracts. 4. Pour the honey mixture over the oats and stir to combine until evenly coated. 5. Line a baking sheet with parchment paper and spread the oats evenly onto the baking sheet. 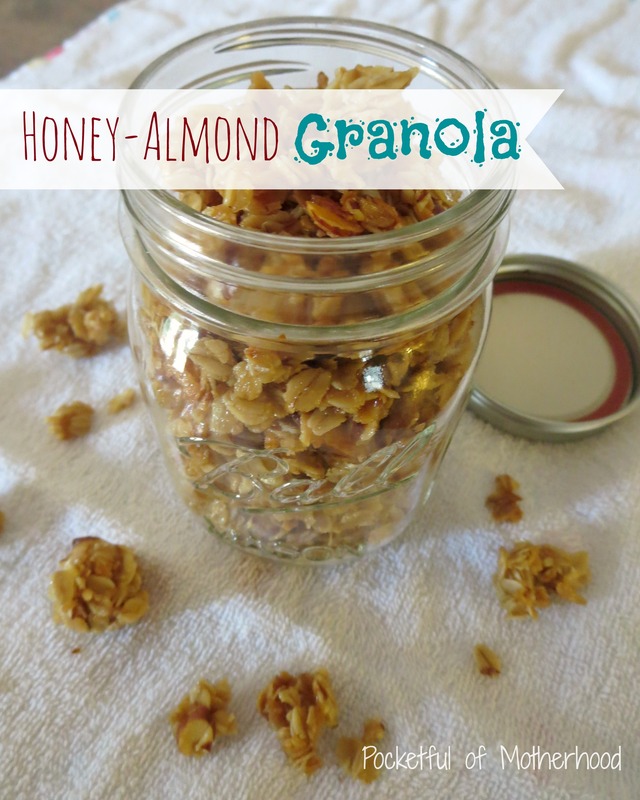 Drizzle a little extra honey over top (optional step, but it gives the granola nice texture). You don’t want your baking sheet too crowded, so you may need a second baking sheet. It also helps if your baking sheets have sides to avoid liquids from the oats spilling into the oven and burning. 6. Bake the oats for 10 minutes. Give the oat mixture a good stir. Turn the oven up to 350 degrees and cook for an additional 5-10 minutes. The granola is done once the oats are slightly golden brown and toasty. The granola may be a little soft but it will harden as it cools. 7. Let the granola cool on the baking sheet for a few minutes. Then transfer the parchment paper with granola to a cooling rack so that it can cool further. Let it cool for about 30-60 minutes. Once it starts to harden, break apart the oat clusters. 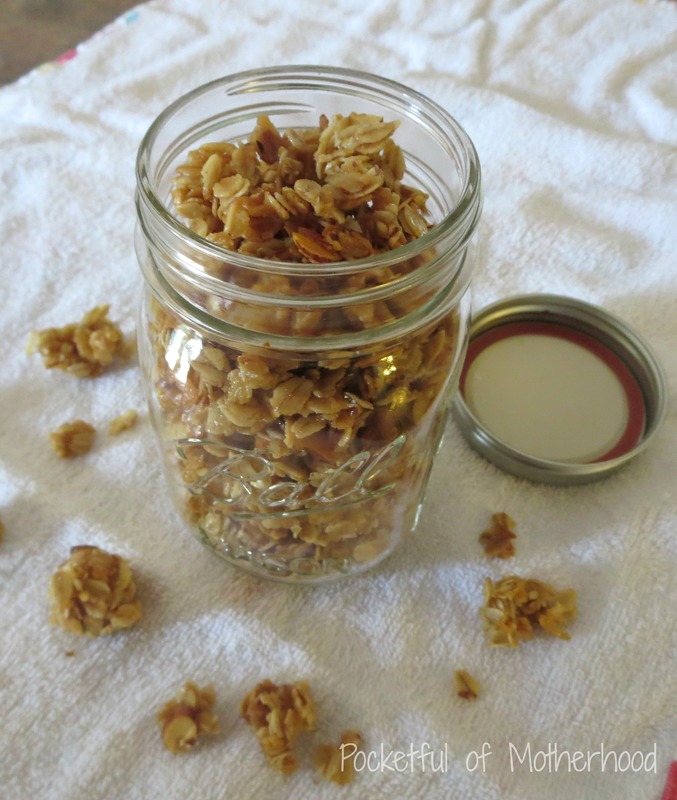 Store the granola in a Ziploc bag or airtight container. This recipe looks delicious! The hardest part will be having the self control not to eat all of the granola myself. Granola is my favorite 🙂 Thanks for sharing this recipe! Thanks Amy! Granola is a favorite if mine too. I didn’t do very good in the self control department while I was making this because I kept nibbling at it…it is slightly addicting ;). 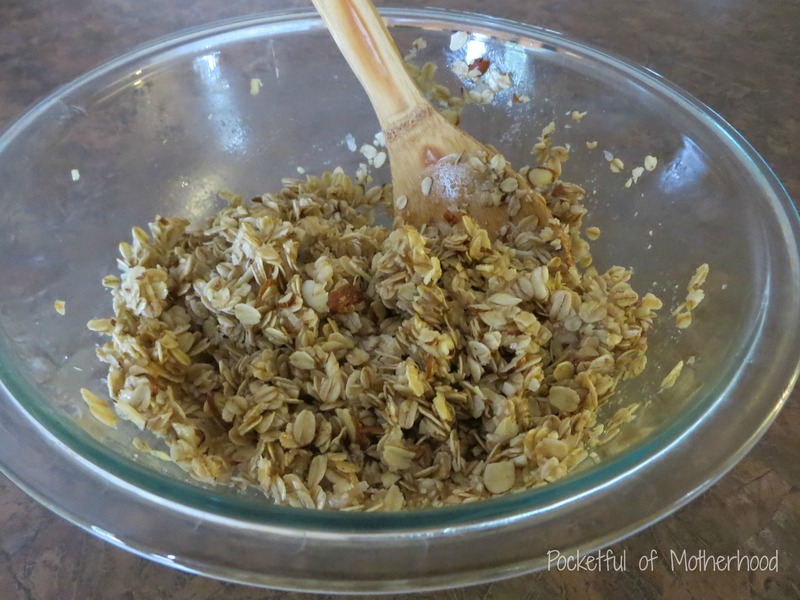 I love homemade granola–this sounds like a great recipe, Hannah! Thanks Nancy! I can’t believe I haven’t made homemade granola until now. I’m definitely going to make it again and try different varieties :). Oh wow, this looks amazing! (Your photography skills are really great, by the way!) Pinning!! Oh thank you Valerie!!! That means a lot to me :)!! I love granola! This looks so good! Me too and thank you!! Thanks for sharing this! It looks good! And I have all the ingredients, except for the almond extract. Thank you Ai! You could do without the almond extract ;). It just brings out the almond flavor more. Thanks Vidya! It is yummy to munch on :). I am gunna have to try this! Thanks Lori 🙂 I loved the creative way you did your post! I’ve moved! Find me at my new blog, Woven Beautiful!